StarLitStudio: more lavender...a clip this time! more lavender...a clip this time! The closest Target store to me is about 35-40 minutes, so I don't go very often...but when I do I have a looooong list! The first thing I hit is their dollar spot - I found a package of two big plastic clips with a nice magnet backing for $1. I'm always looking for nice yet easy and inexpensive gift ideas for teachers, neighbors, friends... and I saw potential to collage the front of these big clips! Lavender image was stamped and colored, edges distressed & inked. 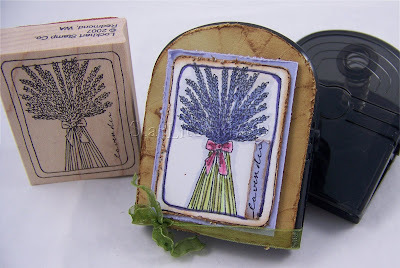 A small strip of lavender cardstock was stamped with just the word 'lavender', trimmed with scissors, distressed & inked. The entire stamped image was outlined heavily with Copic marker BV31 to make the image 'pop' (just like the soldered piece in the previous post). Each layer of this collage was distressed with a Tim Holtz paper distresser. It gives a wonderful, raw, aged look to your projects, especially if you ink the edges afterwards! The colored image was matted on a piece of lavender cardstock (edges distressed too). 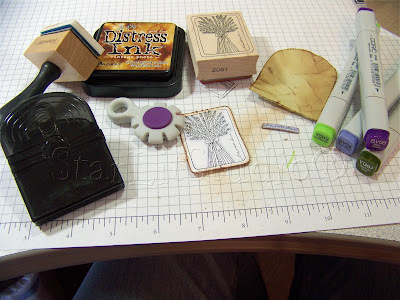 The clip was traced on a piece of taupey-olive cardstock, then cut out. Edges were sanded, distressed, then I crumpled the whole thing up in my hands. Flattened out, then swiped the surface with a Distress pad (Vintage Photo) then blended with Tim Holtz's ink blending tool. Taupey-olive layer was adhered to the clip, then the matted image was adhered with dimensionals. Since I distressed the edges of the taupey-olive layer, the 'fit' of my clip pattern was much more forgiving than if I had left the edges plain and untouched. It looks like a perfect fit when in reality it was not such a neat job before I distressed the edges! :) Olive ribbon was tied into a bow around the clip, then the bow and tails were hit with a heat tool to shrivel the ribbon and give it that nice, vintage look! Thank you for stopping by! Lockhart Lavender image; Palette Noir Black, Distress Vintage Photo; white cardstock - Papertrey Ink, taupe/olive and lavender cardstock - Stampin' up; Target big clip; Copic markers; olive sheer ribbon; heat tool; Tim Holtz distresser; Tim Holtz ink blending tool. I wish I could look at items and think of creative ways to use them, Love what you have done with this $ clip, you've made it into a priceless gift! Oh for heaven's sake! I actually have some of those clips. I bought them for myself for my magnet boards, and I was all excited to get such nice, big clips. Never once did I think to "alter" them! It's just beautiful, Cindy! A great idea - I'm going to have to case it. Thanks for sharing!!! What a awesome idea...and it's so beautiful! !